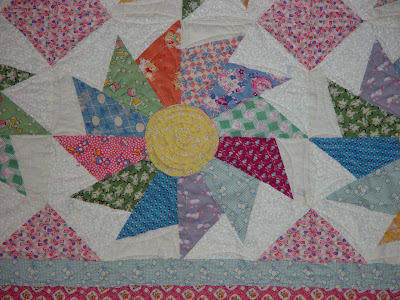 quiltcrazy: "Daisy, daisy. . ."
I have always considered my three nieces as my girls (complementing my 2 boys) and they love that I do things with them and for them. This quilt was made for Autumn, Abby's daughter, in 2007. The Retro fabrics and pattern were her choice. 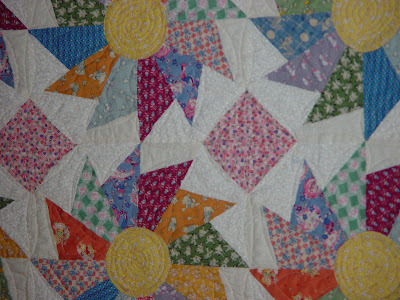 I found this pattern in an old issue of Traditional Quilts, issue 57. 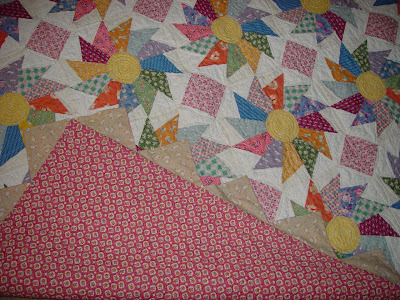 “Appalachian Sunset”, designed by Paula Hammer was done in feedsack prints. A warning: I cut all my pieces using the templates provided. I didn't discover that one was reversed until I started sewing. Fortunately it was a background white on white print that didn't really show in the final product. MAKE A TEST BLOCK BEFORE CUTTING THE REST! I paid dearly to have this custom quilted but the result was worth every penny. The prairie points were not folded but backed, stitched and turned. This allowed me to use multiple strips of leftover fabric for the front. Oh my gosh, I absolutely love this quilt. I love the 30's repros so much and this quilt design is perfect for the. I am going to do a search for that magazine online!